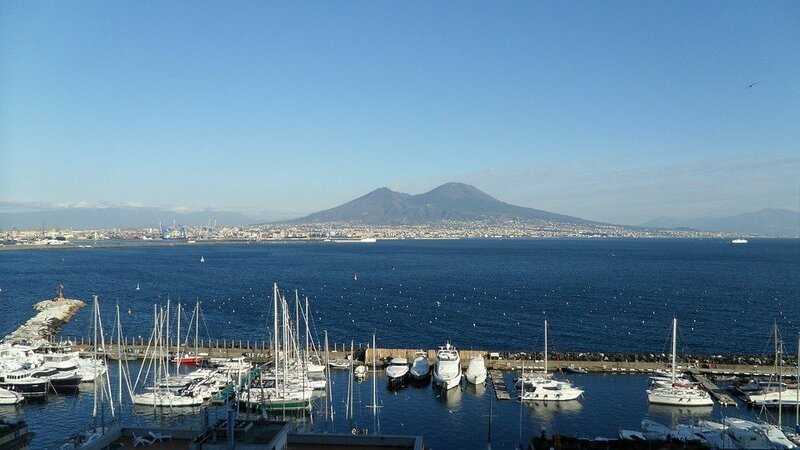 Naples is one of the most beautiful cities of Southern Italy and the third largest city of the Country. Full of history, art and sights to visit it is the largest and closest to Sorrento & the Amalfi Coast. As I always say the best way to get from Naples to Sorrento depends on where you are leaving but the most comfortable way is the private transportation. If you are reading this post it means that you need the same information and your final destination is Sorrento or the Amalfi coast. Traveling from Naples to Sorrento, whether you arrived by plane or train, hydrofoil or private transportation, it is easier than you think: this is a complete guide with all the tips you need to make the best choice. Circumvesuviana: this is the local train that connects all the cities between Naples and Sorrento; the journey to reach our beautiful town takes about one hour and a half. The first train is at 6.11 AM and the last is at 9.49 PM, trains run every 30 minutes and a one way ticket costs € 4,90 per person. The ticket can be easily bought at the station’s ticket office without having to prebook. Why getting from Naples to Sorrento by train? Traveling from Naples to Sorrento, whetever you arrive by plane at the Aereoporto Internazionale di Napoli Capodichino or by train at the Stazione Centrale di Napoli, it is easier than you think if you travel by private transportation. Here’s a map to better understand how to travel from Naples to Sorrento by private shuttle. A private transfer is obviously the most comfortable way to travel from Naples to Sorrento, as they will welcome you at the arrivals gate, at the railway exit or outside your accommodation if you are staying a night or two in Naples, and take you directly to the door of your apartment or hotel. This type of transportation has to be planned before you’re arrival and we can suggest you a couple of local reliable and english speaker drivers. You’ll have all the comforts that a mini-van can offer, such as air conditioning, comfy seats to enjoy a relaxing journey and of course flexibility. Why getting from Naples to Sorrento by private transportation? We always recommend to our guests, our first class drivers, who will give you some basic information about our beautiful coast and also give you the opportunity to make stops to take pictures in some breathtaking locations. Probably this one is the best and most convenient way to travel if you are in a group of more than 3 people or if you’re travelling with family and small children. Here’s a map to better understand how to get from Naples to Sorrento by bus. The bus is the cheapest way to reach Sorrento, especially if you’re travelling by plane and you do not want to lose time to reach the Railway Station or the Port of Naples. In fact, from Capodichino, there is shuffle service served by the company Curreri that departs directly from the airport exit and reaches Sorrento bus station, with few stops. There isn’t a toilet onboard and they won’t make any service station stops. Why getting from Naples to Sorrento by bus? If you’re a lover of the sea and want to start your holiday with the sensation of the Neapolitan’s sea breeze on your face the ferry is the best choice for you! The ferry is also the fastest and easiest way to reach the Sorrento coast, as you’ll skip any kind of delay with traffic. Whether you’re travelling by train or by plane, to reach Molo Beverello (Port of Naples), you’ll have to take a quick ride of 10-15 minutes by taxi and it will cost around €10,00. Here’s a map to better understand where Naples harbour is located. 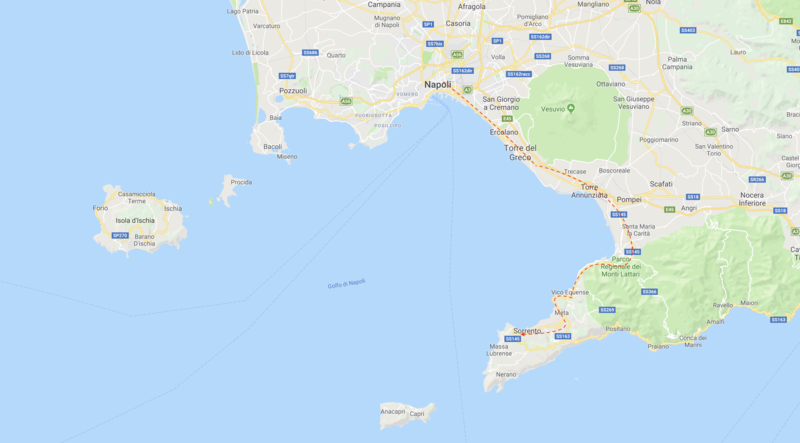 Why getting from Naples to Sorrento by ferry?